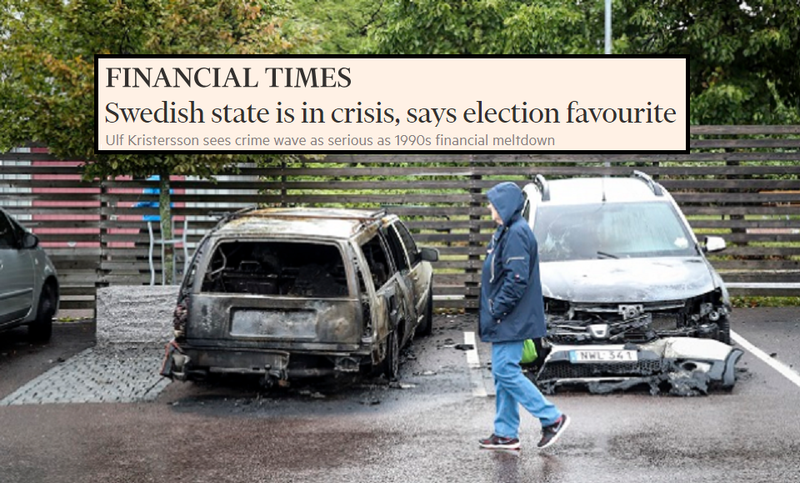 Sweden saw further arson attacks over the weekend as the European press starts to worry about the outcome of their national elections that are three weeks away. The Scandinavian nation is set to take a hard right turn due to its descent into an unending abyss of violence and crime. It was about 18 months ago, in February of 2017, when US President Donald Trump stated in his now infamous speech: “Look at Sweden, they took in so many….” and the MSM ridiculed him for it. Related coverage: <a href="https://thegoldwater.com/news/34109-Sweden-PM-Fears-Election-Result-As-Arson-Attacks-Continue-Video">Sweden PM fears election result as arson attacks continue (Video)</a>. He admitted that the right-wing Sweden Democrats have rightly captured the mood of the Scandinavians at the moment and they are therefore leading most polls, to the surprise of many European onlookers who never assumed Sweden would turn right so hard. Related coverage: <a href="https://thegoldwater.com/news/33468-Sweden-Citizens-Now-Worry-As-Much-About-Crime-As-Peru-Mexico-Or-Brazil">Swedes now worry as much about crime as Mexicans or Brazilians</a>. Sweden, long seen as one of the world’s happiest, healthiest and most successful countries, has been rocked by crime, shooting, grenade attacks and, as of late, arson attacks by youth gangs setting cars on fire. The last event saw 100 cars being damaged in a garage in the Gränby neighborhood of Uppsala, just before 2:00 this Monday morning. Mr Bosse Eriksson from Uppsala's emergency services: "It was two cars that were burning, but the garage contained around 100 cars which have been damaged to a greater or lesser extent by the heat. The fire was contained in the garage the whole time." One more country swings right…. has the left won anything lately? Sweden has already lost the battle. With the numbers of rapeugees that flooded in, the true Swedish have zero chance at holding the majority. The ones flooding in don't even take time off from purging out kids while they are in the camps unsure of their future! Well with 6-8 kids per couple vs 1-3!! Not much advanced math to figure out. Thanks for the correction, Johan.